About 1400 students take advantage of the dynamic liberal arts education at Hood College, a residential college for women (Hood also offers commuter and evening programs for male students). Located in historic Frederick, MD, the school's proximity to Washington D.C. makes for phenomenal internship options, from the White House to the American Red Cross to CNN. What is a typical Hood College student like? Describe the type of person that should attend Hood College. The typical Hood College Student is really friendly and studious. The type of student that should attend Hood College should be someone who loves to have fun and is open to meeting new people. 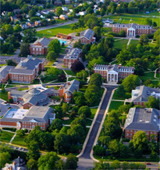 What are the top 3 reasons someone should attend Hood College? 1) Free Laundry 2) Free T-SHIRTS 3) World-Class Quality Teachers who are extremely passionate in their subject. What was a typical Hood College student like in high school? Describe the type of person that should attend Hood College. Hood College is full of hard-working students, athletes, and a combination of the two. Students who live the small-town atmosphere will enjoy Hood College. Those who like to work more one-on-one with teachers will also thrive here. Hood College is a place of consequence and continues to make a significant impact on the lives of our students and the communities we serve. Hood is more than a beautiful campus in Frederick, Maryland; it has also been home for more than 100 years to more than 17,000 graduates living the the United States and around the world who call Hood their alma mater. Hood's core values and traditions, our commitment to continuous improvement, comparative excellence and exceeding student expectations, have made it the treasured institution we know it to be. Our world-class faculty and caring support staff present an exciting university-like education in a small college environment to highly motivated students by integrating the liberal arts with professional studies. Beyond the campus, Hood works cooperatively and strategically with its many partners to augment student learning and enhance the quality of life in the region and beyond. As a prospective student or visitor, you'll find many of your questions about Hood answered online. Please take time to explore the website and Hood College, where practical, brainy, charming, surprising, friendly and exciting things happen every day. What are the top 3 things that students do for fun at Hood College? The average student pays $24,470 for tuition, fees, and other expenses, after grants and scholarships. Learn more about financial aid at http://www.hood.edu/finaid/. Estimate the net price for you at http://www.hood.edu/financial-aid/cost-of-attendance/net-price-calculator.html. Hood College participates in the NCAA Division III for college athletics. Want more info about Hood College? Get free advice from education experts and Noodle community members. Are biology majors required to do field research in order to graduate at Hood College?